Rabbit Moon's line currently selling on Zulily are so darling and perfect for warm spring and summer weather, they almost make me want to have another set of baby triplets so I can dress them in these. 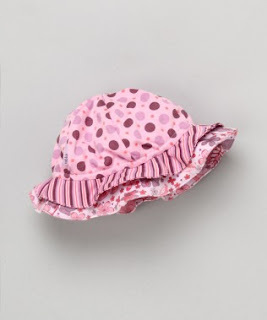 Featured in the pictures in this post are Rabbit Moon's little cotton infant girl's dress (now $15.99, regular $31) and matching double ruffle-brimmed sun hat (now $7.99, regular $14). Don't you think this feminine pink polka dot and striped print mix would be the perfect way to cheerfully welcome the longer days ahead? 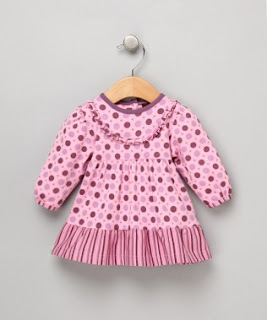 This Rabbit Moon dress is available in infant sizes 0-3 mos, 3-6 mos, 6-9 mos, 9-12 mos, 12-18 mos, and 18-24 months. The coordinating hat comes in two sizes: 0-9 months and 12-24 months. Both Rabbit Moon items as well as a broad selection of other styles from the same brand can still be purchased on Zulily.com as of the date of this posting. But hurry, you can only take advantage of this particular limited sale until it ends on April 12, 2010 at 7 a.m. PST. Zulily runs special savings events constantly featuring a delectable assortment of comparable other brands, too, with each sale limited to 72 hours in duration. The best part is that MommyBlogExpert readers get $10 off purchases of $30 or more whether you purchase Rabbit Moon or any other brand Zulily sells. Remember whatever you decide to purchase for yourself or someone else, be certain to use coupon code MOMBLOGE10 (Offer expires 4/16/2010) at checkout to take advantage of this opportunity to save big. Rabbit Moon is just one of the limited-time sales you can shop for better merchandise on Zulily.com right now. New short-term sales of other cool brands for kids and moms that you can select from are added daily, so there is always something fresh and new on the site each day. * $10 off Zulily.com purchase of $30 or more when you use code MOMBLOGE10 at checkout. Note: this coupon code expires April 16, 2010. Zulily.com is an online marketplace where you can buy top-quality apparel, gear and other goodies for moms, babies and kids (both boys and girls). Members can save up to 70% off retail prices—not to mention discover all the exciting new brands showcasing their products here. Only members can shop their sales, but membership is free and sign up is fast and easy. After you register, be sure to invite your friends to join, too, as well as to visit this MommyBlogExpert blogpost to access the savings code they'll need to get $10 off purchases of $30 or more. As the Zulily shopping community grows, so will their ability to offer you even better prices and selection. FTC Disclosure: MommyBlogExpert is a guest blogger for Zulily's Blog. However, MommyBlogExpert did not receive any products, payment or other compensation associated with this post. See complete FTC Disclosure information that appears at the bottom of MommyBlogExpert's main page and at the bottom of every individual post on this blog, including this one. I just like to look. But I can't because I have to sign up. Which I don't want to. I have enough spam! I am 73. Just lookin"!